My conversion to the Mac occurred as my creative side began to blossom in 2002. At that time, I began editing video on my Sony TRV-33 ($1,000 at the time). Starting with iMovie 1.0 and eventually graduating to Final Cut, which I still use today. At the same time, I started seeing just how enjoyable photography was as well. When my TRV-33 started malfunctioning on vacation in 2006, I opted to stick to photography and swore never to buy another Sony product again (Italians can hold grudges like that for a long time). At this point, I was shooting with a Konica Minolta Dimage Z3 4.0 megapixel (MP), a great camera with plenty of flexibility and a nice 12x zoom lens. Using iPhoto, I was able to easily enhance my images, learning the advantages of various exposure settings, etc. On a later trip to Peru in late 2006, I picked up a little Canon PowerShot A530 for under $100. I opted not to bring the Dimage due to its size - and (since I was unfamiliar with Latin America at the time) it would have been more likely to be stolen. The 3.2 MP Canon worked great, and by now I was running Aperture on my PowerBook for added photo editing functions. For my next trip, I wanted something with better resolution and a little smaller size. I sold the Dimage and gave the Canon to my sister; I picked up a Canon Elph SD850 IS, an 8 MP camera with an image stabilizer and a 4x zoom lens. In December of 2007, I headed to northern India with the Elph. Pictures came out beautifully, but I couldn't help but miss the zoom and extra creative control the Dimage had over the Canon, not to mention that one of the group members had a Nikon D80 digital SLR (DSLR) with her, which was the focus of my envy. Upon returning to the States, I started thinking about selling my little Canon. Travel is one of the greatest joys in my life, and I want to capture my adventures the best I could. A few months passed. I received a new MacBook Pro as an early graduation present and purchased a copy of Aperture 2 (which ran too poorly on my old G4). I gave in to the itch and sold the Canon. I wanted a DSLR, but I didn't want to spend more than $600 to $700 for my first model. What were my options? I started learning about DSLRs and narrowed down my choices to the following three models: Nikon D40x, Olympus Evolt E-510, and, last but not least, the Sony Alpha α200. Once I picked up the α200, I was sold. It just felt perfect in my hands. It had so many features found in more expensive cameras, such as the Nikon D80, and it was such a joy to use. I was concerned about picking up another Sony product, but since my video camera died in 2006, I had picked up a PS3 and PSP and was on the road to forgiving Sony for the shabby product it sold me all those years ago. I headed out to my local Ritz Camera and shelled out the $600 for the Alpha. I've owned this model for about two months, and I'm really happy with it. The battery life is amazing, and some of the pictures I've taken with it so far have been breathtaking. Admittedly, I'm still learning to use all the features a DSLR has to offer, but I'm progressing quite rapidly. 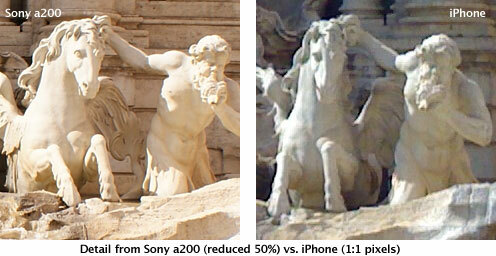 The α200 traveled with me to Italy for three weeks, a perfect trial run for my new toy. The Sony functioned as my primary camera, while my iPhone, with its fixed focus lens and 2 MP resolution, functioned as a good backup when I was wasn't a tourist. My results were happily very good. The α200's battery life was superb - during my 3 week stay I only charged it three times, and that was with over 1000 total pictures taken. The zoom lens was adequate, but an upgrade would be desirable before my next trip. Low light situations aren't as good, but thanks to the high amount of customization options, they're definitely doable with some tweaking (sans flash). Post processing was accomplished using Aperture 2.0 on my MacBook Pro. I was happy the fantastic results transferred to my machine and shared with Web Gallery to everyone back in the old country. My only gripe is with the widescreen setting that causes some artifacts to occur on the picture in certain circumstances, but this could have been a poorly set configuration option on my part. My only regret is not having waited for the α300 with Live View. This would have made life easier for shots that required a higher vantage point or odd shooting angle. But reselling the α200 shouldn't be an issue if I really want the next level up. If you're in the market for a DSLR, keep the Sony Alpha line in mind while you shop; it's really giving Nikon and Canon a run for their money.